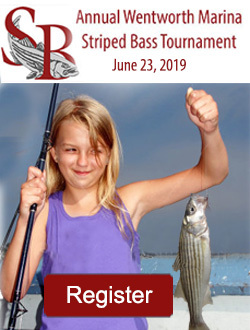 NEW CASTLE — Wentworth Marina and Little Harbour Charitable Foundation will host their 20th Striped Bass Fishing Tournament in June. A Veterans Day of Fishing will raise money for veterans programs at Northeast Passage. The Striped Bass Tournament for Kids on June 24 supports programs for children and youth in the Seacoast. 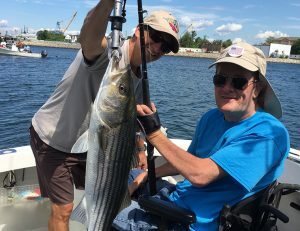 On June 20, 17 disabled veterans will be treated to a day of fishing, led by Ritchie White and a group of boat captains. “We want to focus on honoring these veterans for their service and sacrifice, ensuring each veteran leaves with a special memory and knowing how much their sacrifice is appreciated,” said Paul Holloway, president of the foundation. Northeast Passage uses recreational experiences as a tool to empower individuals with disabilities. The Drug Free Kids initiative has brought substance misuse prevention programs to students in grades 6-12, educators and parents in Portsmouth, Rye, Greenland, Newington and New Castle. Other programs supporting healthy choices include 68 Hours of Hunger, Arts in Reach, Gather and NH Coastal Conservation. Register before June 19 at www.stripertournamentforkids.com. The catch and release tournament is for anglers age 8-16. Awards will be given for striped bass and mackerel. Visit the website for information and registration details. Follow @stripedbasstournament on Facebook and Instagram. LHCF is a totally volunteer organization. All funds are used for programs that improve the lives of children, youth and disabled veterans in the Seacoast.